Hamza Ihirwe grew up loving the arts and he always dreamed to make it his lifetime career, but when he joined high school in early 2000s he found himself studying Mathematics and Physics. At Group Scolaire Officiel Indatwa in Huye district, where Ihirwe studied, the school used to hire barbers to shave students. Little did the school Director know that someone at his school was doing ‘internship’ learning from the barbers. Ihirwe befriended the barbers until they gave him chance to handle hair clippers. “I never had any official hair treatment training. I used to go and watch them at work and once any of them takes a break, it was my opportunity to grab the machine,” Ihirwe told KT Press. This helped him develop his skills and turned it into a holiday occupation. 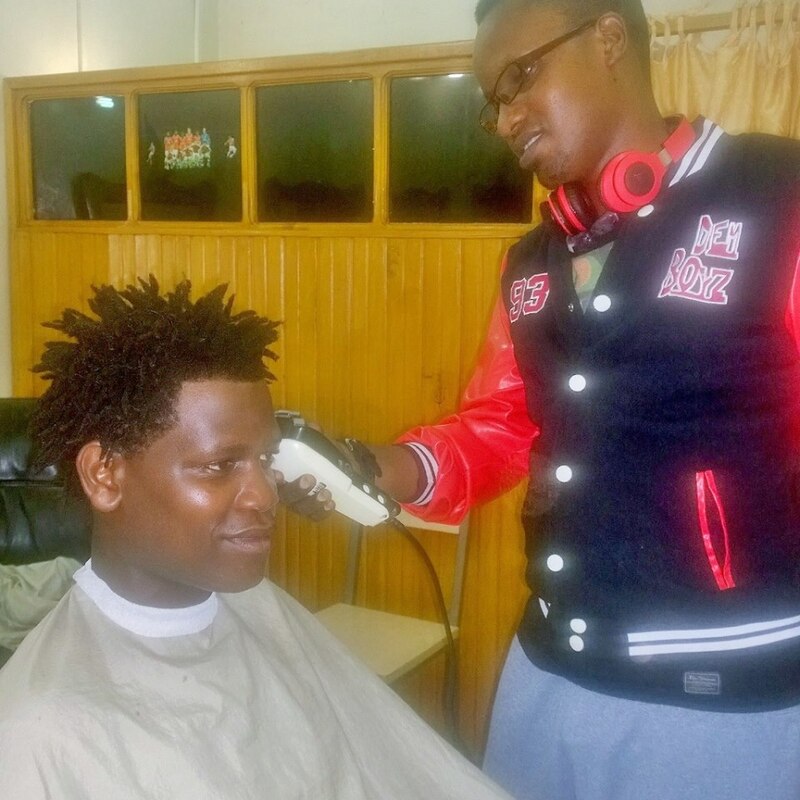 While other students would be idle during the holidays, Ihirwe would spend his holidays around barbershops in Nyamirambo for part time jobs. After discovering the secret behind haircutting, he realized that indeed, all was not lost in his dream to become an artist. “In my childhood, I loved arts, especially drawing and that’s what could take my spare time at school. I don’t regret becoming a barber since it involves drawing,” Ihirwe said, adding that “Cutting celebrities hair involves too much drawing”. “Sometimes celebrities love drawings on their heads and even some of the youths! So, you can see I kept my art,” Hamza told KT Press confidently. Ihirwe is a favourite coiffure among many Rwandan celebrities including musicians, footballers and basketball players. 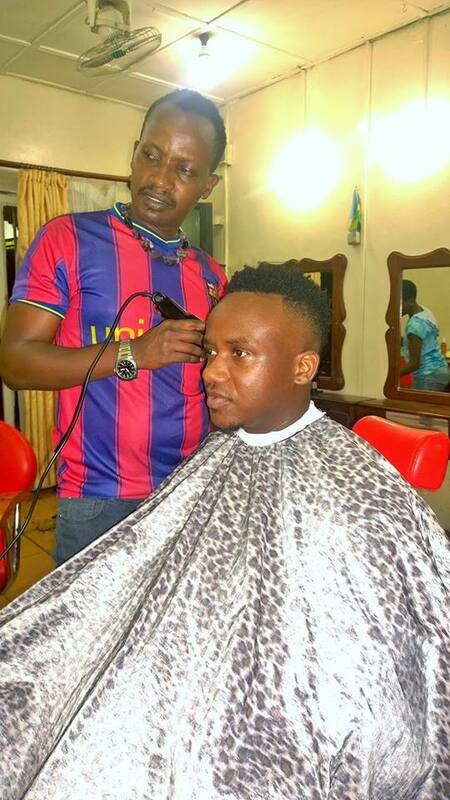 Musicians such as King James, Mani Martin, Social Mula, Buravan, Jules Sentore, Dream Boyz, and Urban Boys would not dare go on stage before Hamza blesses their heads with a stylish cut. When The Ben comes to Rwanda, he can hardly do any performance before Ihirwe puts his magic touch to his hair and beard. Women celebrities such as Young Garce, and Aline Gahongayire when they need to cut their hair, Ihirwe becomes the face behind their beauty. Other Kigali Celebrities that would hardly go without Ihirwe’s art on their heads include Producer Clement Ishimwe and footballers such as Rutanga, Pappy, and Maxime Sekamana. What did it take him to convince stars that he is the right coiffeur? 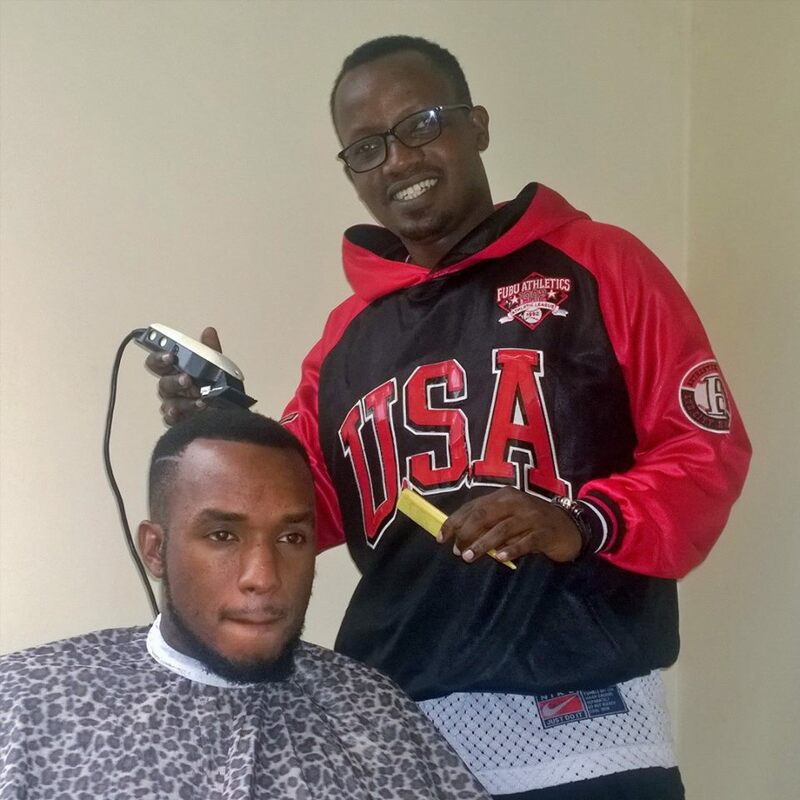 When Ihirwe was still doing a part-time barber job, a Rwandese living in UK became his client every time he came to Rwanda. Unfortunately, Ihirwe was not even interested in knowing his name at the time. In 2004, just after completing his high school studies, this esteemed client developed an idea of starting a barber shop at Nyamirambo – Cosmos, and asked Ihirwe if he could join. He agreed on condition that he begins with a salary of Rwf120,000. At that time, King James and Mani Martin were still in high school and Hamza was their preferred coiffure. “It did not cost me much to attract celebrities. I only had to be creative to keep King James, Mani Martin and other prominent celebrities. I started with them when they were in high school,” Hamza disclosed to KT Press. “When a celebrity is your client, he introduces you to their friends,” he said, relating to a time when King James had a performance and invited him at his home to meet his friends. 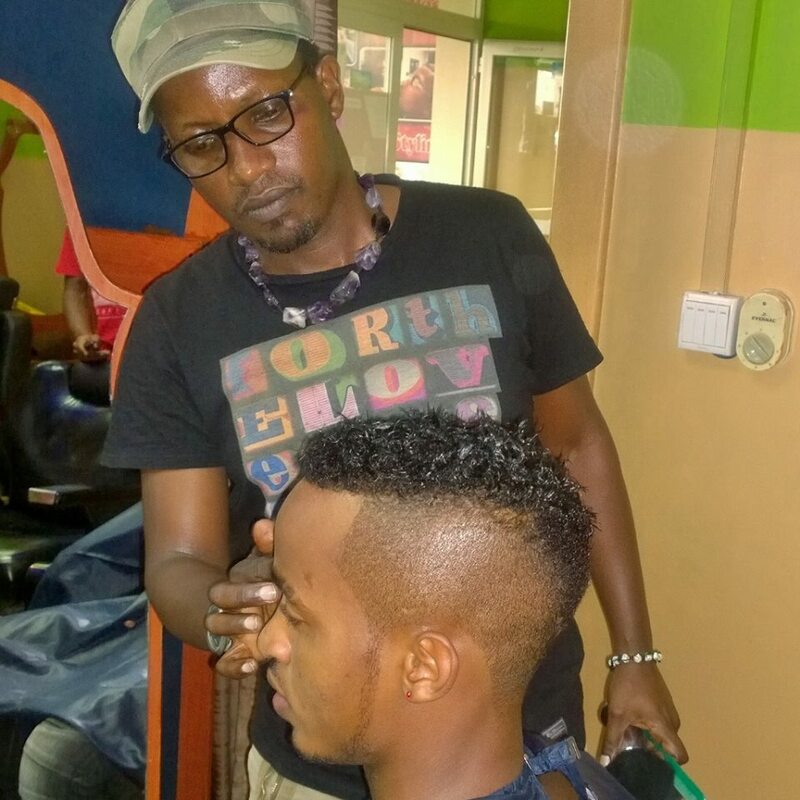 To retain these big celebrities as his clients, Ihirwe keeps learning and updating his knowledge to discover new trending hairstyles. He keeps his eyes open on social media, particularly Facebook and Instagram just to see new styles global celebrities may come up with. “I always have photos for new hairstyles and when a star comes, I make sure I have something new to suggest,” Ihirwe said. But what does Ihirwe earn from his trade? 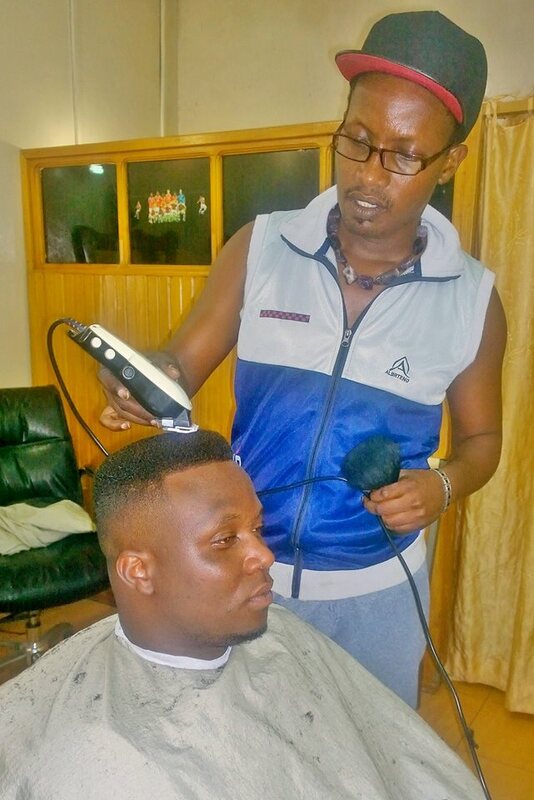 You may think that Ihirwe makes a lot of money from cutting celebrities’ hair, well, this is quite true, but he does not attach any big value to money. “What I put forward is making friends, having people around me, and when you have a star friend, you know what it means,” he told KT Press. At the saloon where Ihirwe works cutting a man’s hair ranges from Rwf2, 000 for a normal haircut to Rwf15, 000. “Celebrities hairstyles sometimes can be tricky since some of them require magic drawings and expensive hair products. So, prices vary depending on the style and products to use,” Hamza said. Tips can also be one of barber’s big source of income though they always come as a surprise. For example Ihirwe talks of a very recent tip of $200 he got from one of the celebrities, but did not want to disclose. 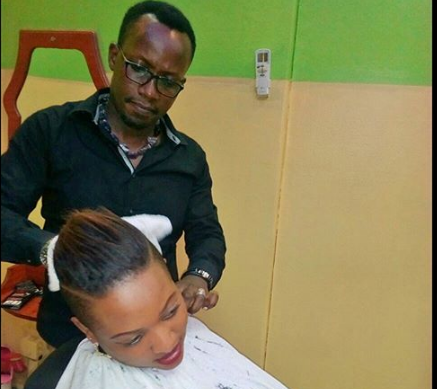 Since nowadays hairdressers are like footballers, they keep moving from one saloon to another and that involves recruitment price, but for Ihirwe, such attitude he says would make his clients lose track of him. Abstaining of talking about his previous recruitment deals, Hamza says it may cost between Rwf3 million to Rwf7 million to recruit an experienced and renowned hairdresser. “That is just recruitment, but it depends on the contract. If a contract includes a loan from your boss, it may even go up to Rwf20 million,” Hamza disclosed. 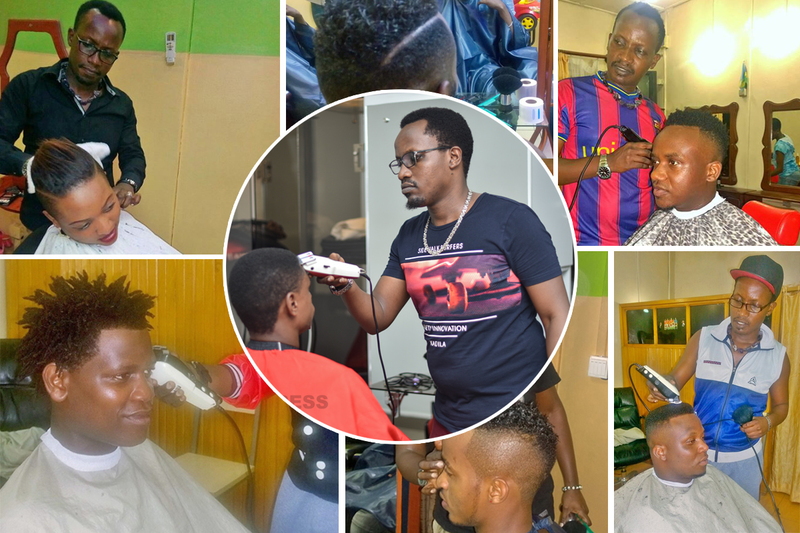 While other hairdressers would never have an idea of starting their own businesses, Ihirwe has a dream of his own named after him “Hamza Saloon” in Kigali, with branches upcountry.